Are you thrill-seeker that loves nothing more than the exhilarating and heart-racing experience of a good clash between rivals? 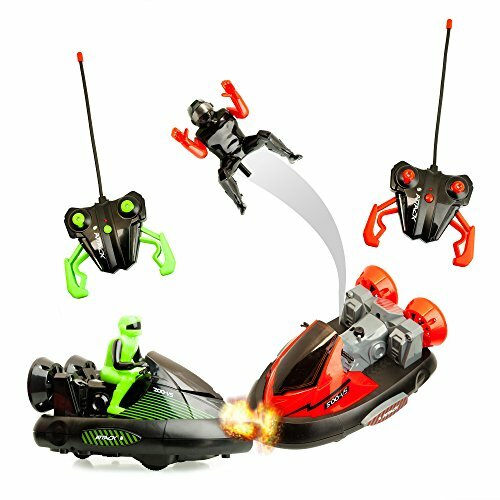 Now you can enter the world of excitement with ToyThrill's Fancy Stunt Remote Control Bumper Cars! Thrash and bash into your opponent until he flies off his seat! Who says you need to be a kid to enjoy the amazing thrill of a good bumper car match? Kids, teens, adults, everyone can join in and bump their way to victory. With such easy, full directional controls, you will be fully immersed in the electrifying experience of bumper cars. Introduce the rip-roaring fun of racing and thrashing vehicles to your family and get the fun started today! Tired of having to get your new toys for your kid every other month because they keep breaking them during intense playtime? No need to worry about that with our toys as they are made with premium, high quality material to make sure your child gets the most fun as possible for months and months. A great nearly indestructible that provides years' worth of entertainment! No household can go without this! Boy or girl, deliver the gift of great fun this holiday season. Your child, nephew, niece, neighbor's child, any youngster in your life will be absolutely happy to receive this as a gift so why not make their year even better with ToyThrill! BUMP AND CRASH: these unique stunt remote control cars are designed to bump and crash into each other. Double the fun by adding bumping into your races. MULTIPLAYER MODE: Each remote controller runs on different frequency so you can play with both at the same time in close proximity, separately or in competition. FUTURISTIC & REALISTIC DESIGN: Everything from the car's model to the driver looks sleek and real to enhance the experience and make you feel the action. KNOCK OPPONENT OFF THE CAR: If you bump your fellow driver in just the right spot, the driver on their car flies into the air! Impact causes realistic crash noises. PREMIUM QUALITY: These bumpers are impact resistant, durable and built to last. They're perfect as birthday presents, holiday gifts, prizes or rewards for boys & girls. If you have any questions about this product by ToyThrill, contact us by completing and submitting the form below. If you are looking for a specif part number, please include it with your message.